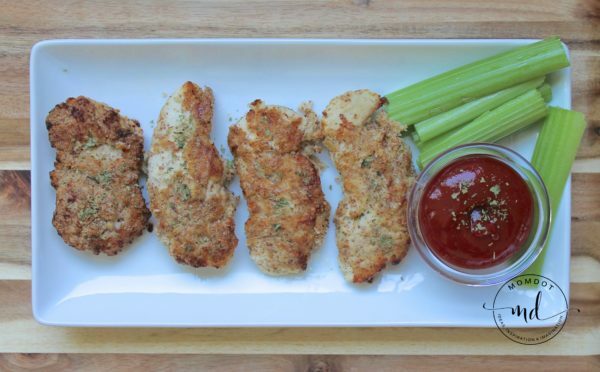 Keto Baked Chicken Tenders are a perfect Friday night finger food. Covered in a perfect crust that is dip-able, you won’t be able to get enough of this crispy chicken recipe! Personally, when it comes to weekends, I am ready to take it easy on the cooking but I still want something delicious. I also don’t want to be tempted to hit up fast food as a last minute decision, adding to my waistline while diminishing my wallet. If you find yourself riding that very same line every week, make sure you put Keto Baked Chicken Tenders on the menu. It’s an easy and delicious chicken recipe that will give you all the temptation of great restaurant food, minus the guilt. Plus, no one will know if you have seconds (and you will, trust me!). This version is also so much easier and keeps the kitchen cleaner – whenever I try to deep or pan fry anything I end up cleaning little bits of oil off everything! Let the oven do the work for you. I also love that this recipe is so budget friendly. I usually have all these ingredients on hand in the pantry, so all I need to do is either buy or thaw chicken and dinner is basically done. Scroll to bottom for printable version of this recipe! This chicken recipe serves 4 – 6, depending on how hungry you are, and goes from fridge to table in about 30 minutes. PRO TIP: Every time I am working with raw chicken, I honestly get grossed out. We all know how sick it can make someone to be exposed to what it leaves behind. I love these Kitchen Gizmos– its a cutting board that takes away the worry! Standard cutting boards get scratches which become a breeding ground for bacteria. This cutting board is extremely scratch-resistant, preventing any bacteria from building up, has two sides, and a juice catcher so your defrosted chicken doesn’t leak to the counter. *You can get rid of a whopping 54% of bacteria just by washing it with cold water. *To sterilize up to 99.6% just pour boiling water over the board. For this recipe, I used tenderloins. You may, however, use breasts or even cut the chicken into a “nugget.” The cook time will vary dependent on size and thickness of your preferred cut without needing to alter the original recipe ingredients as long as you use approximately 20 ounces of chicken. To get started on your Keto Baked Chicken Tenders, whisk your 2 eggs into one cup of heavy whipping cream in a medium mixing bowl. Once incorporated, soak your chicken in the cream mixture for 10 minutes. This will ensure a more juicy chicken once cooked. Next, evenly spread 3 Tbsp. Olive Oil into a baking sheet and preheat the pan in a 425 degree oven. Preheating the pan will help crisp the strips by starting them off hot immediately. To make sure the breading stays put and forms that fantastic crispy crust everyone is looking for, take a paper towel and pat off the chicken before your dredge it. Just be sure to toss it directly in the trash – no cross-contamination, please! I also always use disposable gloves when cutting and dredging chicken like this. It makes it so much easier to keep my hands and the kitchen clean. Whisk together the salt, ground black pepper and almond flour in a shallow bowl. I used a 5.25″ x 9″ x 2.75″ bread pan to give me a shallow surface, yet tall walls to minimize spillage as I coated the chicken. This will be the base of your crispy Keto Chicken Crust! Once your pan is preheated and after your chicken has soaked for a minimum of 10 minutes, dip both sides of the chicken in the almond flour mixture until the chicken is fully breaded. Place the chicken on the baking sheet , repeating with all chicken fingers. To keep the mess to a minimum for a dredging assembly line, line up the soaking mixing bowl next to the dish with the almond flour mixture, making sure you have no space between. Place your baking dish at the end of the line and, voila!, a neat and tidy dredge. Bake for 10 minutes on the first side, turn each tenderloin over, and bake for another 10 minutes, or until an inserted instant-read thermometer reads 165F. However, beware, the cooking time on this recipe can vary depending on how small or large you leave your chicken pieces; full breasts or half breasts will take a bit longer than this, nuggets will take a bit less. 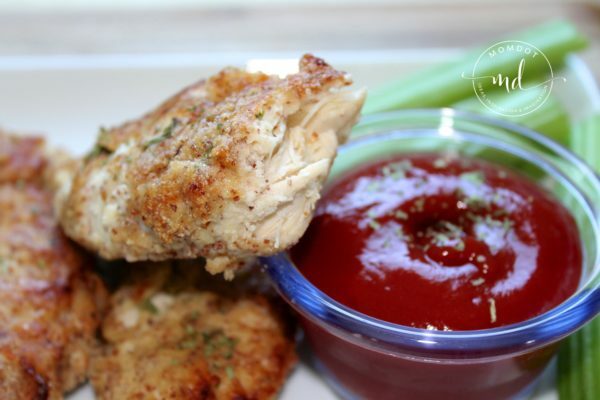 Option: Easily take this Keto Baked Chicken Tenders recipe and turn it into Keto Baked Parmesan Chicken Tenders by adding 1/4 cup parmesan to your almond flour mixture. At our house we love to serve this with a caesar salad tossed with dressing, or over zoodles with our favorite jarred sauce. There have been countless dinners in my past where I got the plates and the food to the table to find the chicken was NOT cooked. I’ve caught my mistake every time so far (knock on wood) but it’s always a bit of a mystery to figure out when the chicken is ready to come out, but not overcooked. You may be asking yourself “If the chicken is white, does that mean it’s done?” This is a common question when it comes to baking chicken. Here are some ways how to tell if a chicken is cooked fully. Color is pretty much the most obvious clue your chicken is done – it should be pale in color and no longer pink. The great trick is to figure out if the inside of the chicken is pale as well. Because I hate cutting the pieces in half (all the juices run out) I use another trick. I take a fork and press it into the thickest part of the largest piece I’m cooking and give it a little twist. This lets me see both the color of the juices in the chicken and the color of the meat inside. When cooked, the juices should be clear, and the meat should be pale inside as well. Pinkish juices mean more time in the oven! Another easy way to tell your chicken is ready is by size. Until the very end, when the interior of the chicken cooks (because it’s cooking from the outside in) your chicken pieces should remain the same size as when you put them in. But in those last minutes when the inside cooks, the piece should visibly shrink in size. Obviously, this isn’t an exact measurement, but it has gotten several meals to the table without me accidentally over/under cooking more than a few times. Temperature is the most objective way to tell whether chicken is cooked. The USDA recommends cooking all chicken to an internal temperature of 165F. If you’re cooking pieces with the bone in, or a whole chicken, you want to take the temperature in the largest piece of meat, without hitting the bone. If you do hit bone, the temp will usually read higher than the surrounding meat which means you take the whole thing out too early. Chefs also recommend pulling meat a few degrees before the final desired temp to account for carryover cooking – the claim is that the meat will continue to cook for a few minutes and increase in temp after you take it out and let it rest. However, in all my attempts, I’ve never had the meat do anything but drop in temp when I take it out, so I always cook to the end temperature I want. Experiment with this. I love a probe thermometer for chicken – you insert it before cooking, and it alerts you when the meat reaches the temperature you set. This way I’m all set to monitor the temperature without opening my oven, without wrestling with chicken in front of the hot oven, and I know when the meat is most likely to be done. If you don’t have a probe thermometer, any standard meat thermometer works fine – but remember to think about cross contamination – once you’ve taken the temp of undercooked meat, you want to disinfect it before you use it again. I just give it a quick wipe with an antibacterial wipe. Raw chicken is sort of rubbery and wobbly – cooked chicken is firm but tender. Getting the feel of chicken’s doneness by feel is probably the most challenging, but if you combine texture clues with the others, you’ll be close to landing perfectly cooked chicken on the table. The best way to start “reading” the texture of your chicken is to gently press down on the middle of a piece and feel for give. Does it feel firm? Does it feel gooey? Try to compare the texture of the meat you have to what you’ve had on your plate before. Overall, I find this the most difficult way to test boneless, skinless pieces, but much more helpful when cooking bone-in or whole chickens. In those cases, I try to get a hold of a piece of bone (legs are great for this) and give the bone a bit of a twist. If it moves easily, separating from the meat, you’re likely dealing with completely baked chicken. Chicken is a pretty major staple for a lot of homes. 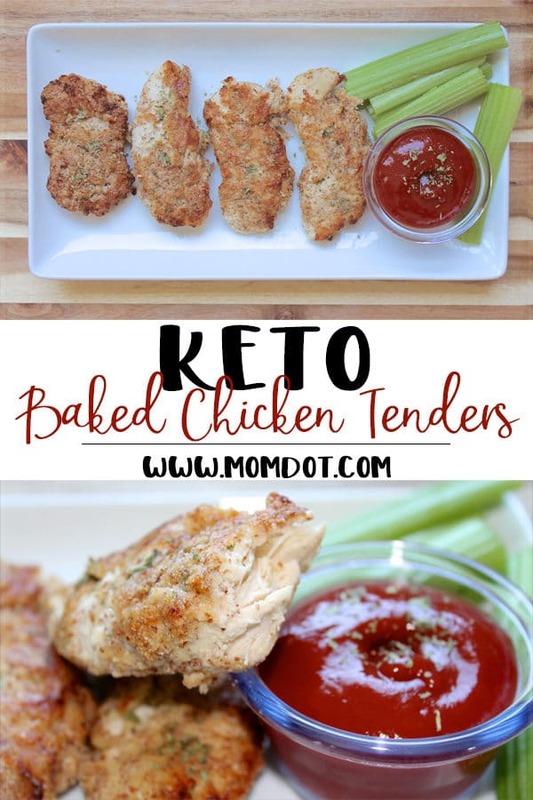 Hopefully with these quick tips, baking things like this Keto Baked Chicken Tenders will no longer be a great mystery in your house. Here’s to dinners without surprises! Place the sun-dried tomatoes in a heat-safe bowl and cover with boiling water, soaking for 10 minutes. Place the remaining ingredients in a blender or food processor. Once the tomatoes have soaked for 10 minutes, drain 1/3 cup of the soaking liquid into the blender, draining off the remaining liquid elsewhere. Add the tomatoes into the blender. Blend until smooth, approximately 2-3 minutes. For a more wet texture, add 1/2 cup of the soaking liquid, instead of the 1/3 cup. If you’re tired of chicken recipes, this recipe can also be made with pork chops, is fantastic with turkey breast and even try a firm white fish like tilapia or cod. It’s one of my favorite ways to help round out our proteins in the week and lets me buy whatever is on sale at the store that week. Or here is a TOP CHICKEN RECIPE Video for OmmygoshthischickenissoGood! Please leave me a rating or a comment and let me know if you love this chicken! You can also tag me with #MomDot on social media so I can see your meals. Thank you! Coat a baking sheet with 3 Tbsp. olive oil and preheat pan in a 425 degree oven. Whisk together 2 eggs and whipping cream in a medium mixing bowl. Soak chicken for 10 minute in mixture. *Soaking the chicken will make for a more juicy chicken when cooked. While baking sheet is preheating in the oven, and chicken in soaking in cream mixture, whisk together the almond flour, salt, and ground black pepper *and optional parmesan cheese* in a shallow bowl. I used a 5.25" x 9" x 2.75" bread pan, giving me a shallow surface, yet tall walls to protect against spillage while coating my chicken. Once the pan is preheated and your chicken has soaked for 10 minutes, coat both sides of your chicken with the flour mixture, placing carefully on your baking sheet. Bake at 425 degrees for 10 minutes, flipping each tenderloin over and baking for an additional 10 minutes, or until the center of the chicken is 165 degrees F.